The area is fun, close to beach, happening but noisy at night. Management accommodating. it was a bit confusing as I had understood that the reception area was in the block that I was staying. Instead it was a short walk away which meant that I had to ring reception and ask them to come out to meet us at the apartment with the keys. We then had to go to the reception to complete admin'. Good Location ,very close to the beach. House is so warm and comfortable. Staff is very nice and helpful. very easy to go for supermarkets, restaurants, all shops. Lock in a great price for Lugaris Rambla – rated 9 by recent guests! One of our top picks in Barcelona.Lugaris Rambla is 1,000 feet from Bogatell Beach, in Barcelona’s Rambla del Poble Nou. Located in a quiet neighborhood, each modern apartment offers an LCD TV, free Wi-Fi and a Nespresso coffee machine. 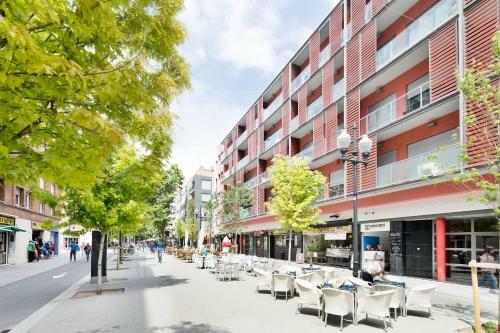 Lugaris is next to Poble Nou Park, and a short walk from Llacuna and Poble Nou Metro Stations. It is also a 2-minute walk from a bus stop. Barcelona Cathedral and Town Hall are just 5 Metro stops away. Many public bus services to the historic city center also pass nearby. Each air-conditioned apartment has a balcony with city views. The well-equipped kitchens have a ceramic hob, an oven and a washer-dryer. Bed linen and towels are provided, and weekly cleaning is included. Other facilities include a tour desk, babysitting and shuttle service. Guests can make use of our car or bike rental. The Lugaris building has a private security service and a 24-hour customer emergency service line. The nearby reception offers a tour desk and car rental. Airport transfers are available on prior request and for an extra charge. When would you like to stay at Lugaris Rambla? This stylish apartment features modern décor, parquet floors and air conditioning. It has a single room and a double room. It comes furnished with a private balcony, free Wi-Fi and an LCD TV. The kitchen has a Nespresso coffee maker, dishwasher, microwave and a washing machine-dryer. Bed linens and towels are provided, and weekly cleaning is included. This stylish apartment features modern décor, parquet floors and air conditioning. It comes with a private balcony/terrace, free WiFi and a flat-screen TV with cable channels. The kitchen includes a Nespresso coffee maker, dishwasher, microwave and a washing machine. Bed linen and towels are provided, and weekly cleaning is included. A welcome package with salt, pepper, olive oil, vinegar, milk, coffee and tea is included. Please note, some apartments are accessible only via stairs. This stylish apartment features a double bedroom and a double or twin bedroom upon request and subject to availability. It has modern décor, parquet floors and air conditioning. It comes with a private balcony, free WiFi and a flat-screen TV with satellite channels. The kitchen includes a Nespresso coffee maker, dishwasher, microwave and a washer-dryer. Bed linen and towels are provided, and weekly cleaning is included. Located 984 feet from Bogatell Beach, this modern apartment features stylish décor, parquet floors and air conditioning. It has 2 bedrooms and a bathroom with a private terrace, high-speed free WIFI and 2 flat-screen satellite TVs. The kitchen includes a Nespresso coffee maker, dishwasher, microwave and a washing machine. Bed linen and towels are provided and a weekly cleaning is included. We hope to have the pleasure of hosting you in the next future, and make you enjoy about our apartments and its great location near the Bogatell Beach. We are arround 25 minuts distance walking from the city center, or 15 minuts by public transport. Area Info – This neighborhood is a great choice for travelers interested in beaches, monuments and city walks – Check location Great location - show map Guests loved walking around the neighborhood! House Rules Lugaris Rambla takes special requests – add in the next step! Lugaris Rambla accepts these cards and reserves the right to temporarily hold an amount prior to arrival. Check-in from 00:00 until 08:00 will be subject to a surcharge of EUR 50. Loss of the keys carries a surcharge of EUR 30. Please note, parties are not allowed at the property. Please note, a weekly cleaning included for reservations of more than 7 nights. Please inform Lugaris Rambla of your expected arrival time in advance. You can use the Special Requests box when booking, or contact the property directly using the contact details in your confirmation. Very close to the bech ! The bedsheets ( full coverage of the blanket and not getting out while sleeping) and towels would have been better and a few more could be provided in the beginning ( like a new and good quality towel)...yet, they were okay. It was very clean and comfortable. Constructions next to the hotel. Mold in the bathroom. Nice room, beds are comfy. Kitchen had very few pots and pans. Needs to be updated.